This month at Miss Millennia we are celebrating weddings! Summer is the most popular season to get married in as couples take advantage of the warm weather to make their vows. We are so very excited to introduce Kaila Dockery, who herself is about to get married in July. She will be giving us first hand insight on her own wedding planning experience as the date approaches! Stay tuned throughout the month to learn more about Kaila and read about all the excitement that comes with weddings. My fiancé is a very straightforward and private guy. He proposed to me at his apartment on my birthday. I wasn’t expected him to propose that day, because he had previously told me multiple times that he was not proposing to me on my birthday. So he played reverse psychology on me and I fell for it. Preparation is going great! I am so thankful that my mother is an event planner; she has definitely allowed my fiancé and I to save a lot of money! At times it can be stressful, because I tend to be indecisive.Since I am a creative person, I have many ideas circulating in my head which makes it hard for me to decide on anything. What has been the hardest part of your process? The hardest part of my process was deciding on whom to invite to my wedding. I plan to host 150 guests and it was hard for me to write a list of names knowing that some people would be left out. I don’t want anyone to be offended that I did not invite him/her. I hope that people who were not invited understand that we have a limit. What sort of unexpected challenges have you come across? Maintaining my headcount has been a challenge. My fiancé and I made a strict list of people we are to invite and included extra headcount for people who would like to be bring an extra guest. However, our invitees are including 2-3 extra people on their RSVP’s. This makes it difficult for us, because now we have to call and inform our guests that we have a strict headcount and their extra guests were not included. How is your fiancé dealing with it and has how much of an involvement does he have in the process? My fiancé is overly involved in our wedding planning. I thought that men would stand back and let the women decide everything. No, not my fiancé, he wants to see décor, help with invitations, make updates to our website and a lot other helpful things. I am very pleased with his perfectionist outlook on our wedding. Did you opt for a wedding planner or not? Why? I did opt for a wedding planner, my mother. Yet, I was still very involved in planning my wedding. What advice do you have for women who are about to get married? Stay calm and imagine that your big day will be perfect! Make sure that you are firm and strict! If you have a budget you need to stay in, remember that you cannot accommodate everyone, meaning everyone will not be invited to your wedding. If you choose to go without a wedding planner, be sure to have a team who is willing to help you before and during the wedding. What type of articles do you plan on writing for the month of June? Wedding planning Do and Don’ts. I can inspire women by sharing how my fiancé and I met, also, sharing my wedding photos/ telling the story of how my wedding was executed. Lady Lennia to me represents a lady in the new millennium striving to achieve her goals who is faced with obstacles, but nevertheless overcomes her fears, obstacles, and continues to rise closer to her goals. 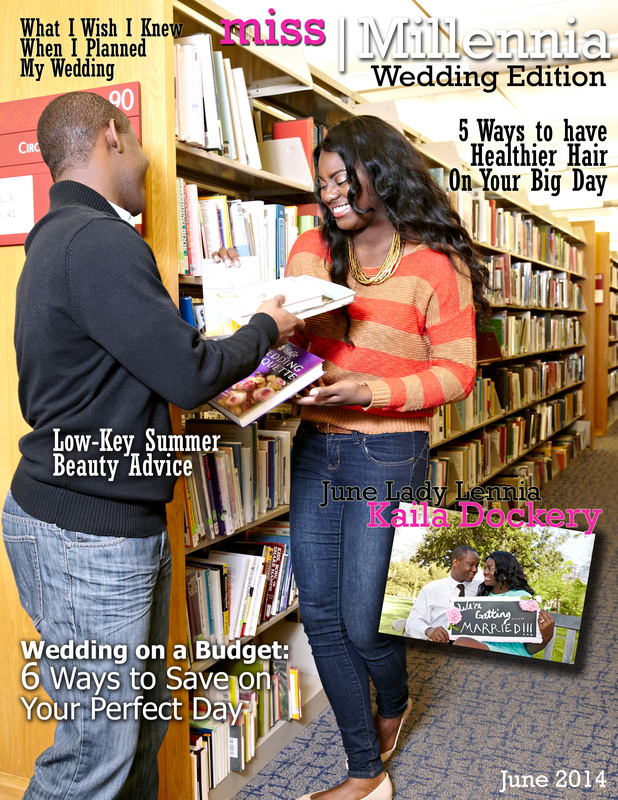 What makes you a great Lady Lennia for the June wedding edition? I am a great Lady Lennia because I have been very involved in my wedding planning, thus I first-hand experienced stress, joy, and can share stories to inspire women who are soon to be married.